Specifically, the EC15 to EC27 compact excavators and L20 to L28 wheel loaders will be introduced. According to Volvo CE, the first electric versions will be presented at Bauma in April 2019, followed by a gradual market launch from 2020. Volvo CE is taking this step following the introduction of a whole series of concept machines which, according to the manufacturer, have met with a very positive response from customers. In addition, the project is in line with the overall strategic orientation of the Volvo Group. At the same time, Volvo CE plans to push ahead with electrification with caution. The company still considers diesel to be the most efficient source of energy for large machines. “While…diesel combustion currently remains the most appropriate power source for its larger machines, electric propulsion and battery technology is proving particularly suited to Volvo’s smaller equipment,” says the Swedish head office. 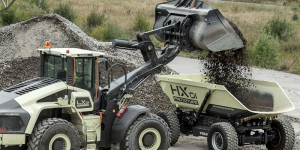 That is why research and development investments will now be invested primarily in the rapid development of electric compact wheel loaders and excavators. “The technology we have been developing is now sufficiently robust and this, together with changes in customer behaviour and a heightened regulatory environment, means that now is the right time to commit to electromobility in our compact equipment ranges in the future,” says President Melker Jernberg. Most recently, Volvo CE made a name for itself as part of a research project on the electrical construction site of the future. In a quarry near Gothenburg, Volvo CE and Skanska tested various electric vehicles for ten weeks. The “Electric Site” project aimed to reduce CO2 emissions in the quarry industry by up to 95 per cent and total operating costs by up to 25 per cent.